Cluster analysis is a way of “slicing and dicing” data to allow the grouping together of similar entities and the separation of dissimilar ones. Issues arise due to the existence of a diverse number of clustering algorithms, each with different techniques and inputs, and with no universally optimal methodology. Thus, a framework for cluster analysis and validation methods are needed. Our approach is to use cluster ensembles from a diverse set of algorithms. This ensures that the data has been considered from several angles and using a variety of methods. We have currently implemented about 15 clustering algorithms, and we provide a simple framework to add additional algorithms (see example("consensus_cluster")). Although results are dependent on the subset of algorithms chosen for the ensemble, the intent is that we capture a variety of clustering outputs and select those that are most consistent with the data. We load an excerpt of an expression data set from TCGA of 100 high grade serous carcinoma samples measured on 50 genes. They are passed as a character vector into the algorithms parameter of consensus_cluster(). Note that the list continues to evolve as we implement more algorithms into diceR. Connectivity Models: "hc" and "diana" are hierarchical models based on connecting objects using a particular similarity or distance metric. Centroid Models: "km" and "pam" uses initial cluster centers calculated based on the mean of the objects, where "pam" restricts the centroid to be an actual object. These models are good for modeling data that produces spherical clusters. "ap" is similar to "pam" because it calculates “exemplars” (like centroids) of the data but is advantageous because initialization of k (number of clusters) is not required.2"cmeans" is similar to "km" except that points can be assigned to more than one cluster. Distribution Models: "gmm" assumes a Gaussian mixture model used by the EM algorithm for clustering.3 The gain in model complexity is traded with utility since the assumption is quite strong. 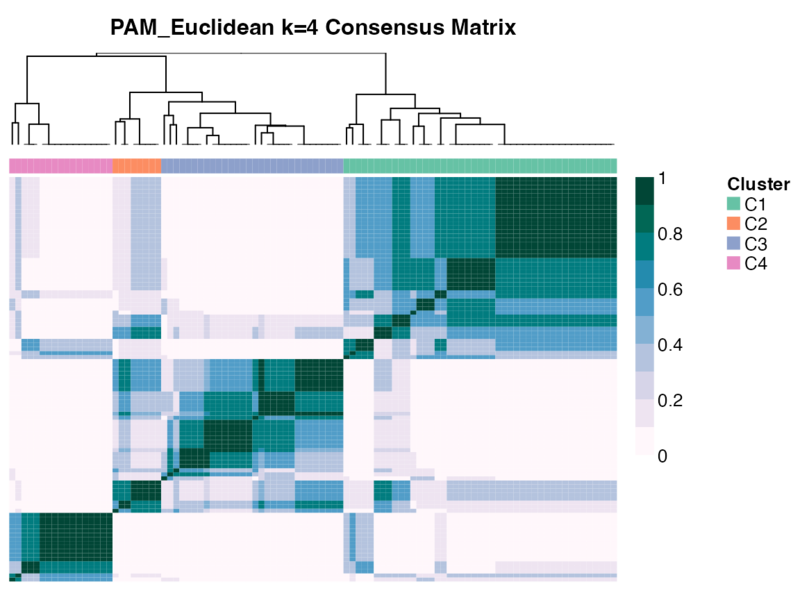 Density Models: "hdbscan" runs hierarchical clustering on the DBSCAN result.4,5 These models assume that each cluster has high density, so when there are overlapping regions, the algorithms may not be able to separate objects that well. Neural Models: our implementation of "som" reduces the data to a two-dimensional subspace using a neural network model, before performing hierarchical clustering.7 A lot of the noise is phased out and cluster stability can be improved from using "hc" alone. Spectral Clustering: Similar to "som", "sc" also performs dimensionality reduction before clustering, but instead uses eigenvectors of a kernel matrix.8 We use a radial-basis kernel function in the package. They are passed as a character vector into the distance parameter of consensus_cluster(). Only the "hc", "diana", "km", "pam" algorithms use the distance parameter. When Monti et al. (2003) first introduced consensus clustering, the idea was to use one clustering algorithm on bootstrapped subsamples of the data. We implement some extensions where a consensus is reached across subsamples and across algorithms. The final cluster assignment is then computed using statistical transformations on the ensemble cluster. The base function of this package is consensus_cluster(), which outputs cluster assignments across subsamples and algorithms, for different k (number of clusters). For example, let’s say we were interested in clustering the hgsc data into 3 or 4 clusters, using 80% resampling on 5 replicates, for these clustering algorithms: Hierarchical Clustering, PAM, and DIvisive ANAlysis Clustering (DIANA). Euclidean distance is used for all algorithms. The output is a 4-dimensional array: rows are samples, columns are different bootstrap subsample replicates, slices are algorithms, and each “box” (4th dimension) is for a different k. Below are the first few cluster assignments for each replicate in the DIANA algorithm for k = 3. #>  "int [1:100, 1:5, 1:3, 1:2] 1 3 1 3 1 1 1 NA 1 1 ..."
#>  "- attr(*, \"dimnames\")=List of 4"
#>  "..$ : chr [1:100] \"TCGA.04.1331_PRO.C5\" \"TCGA.04.1332_MES.C1\""
#>  "..$ : chr [1:5] \"R1\" \"R2\" \"R3\" \"R4\" ..."
#>  "..$ : chr [1:3] \"HC_Euclidean\" \"PAM_Euclidean\" \"DIANA_Euclidean\""
#>  "..$ : chr [1:2] \"3\" \"4\""
Note the unavoidable presence of NAs because we used 80% subsampling. This can be problematic in certain downstream ensemble methods, so we can impute missing values using K-Nearest Neighbours beforehand. There might still be NAs after KNN because of how the decision threshold was set. The remaining missing values can be imputed using majority voting. We can carry on the analysis using either CC or CC_imputed. diceR provides functions for retrieving useful summaries and other results for consensus clustering. If we wish to separately extract consensus matrices and consensus classes for every algorithm, consensus_combine() is a convenient wrapper to do so. Setting element = "matrix" returns a list of consensus matrices. On the other hand, setting element = "class" returns a matrix with rows as samples, and columns as clustering assignments for each algorithm. One can feed in ccomb_class (instead of CC) into consensus_matrix() to obtain a consensus matrix across subsamples and algorithms (and k). A situation might also arise where we initially decided on using 3 clustering algorithms for the ensemble, but later wish to add additional algorithms for analysis. consensus_combine() takes in any number of ensemble objects (e.g. CC and CC2) and combines the results. Internal cluster validation indices assess the performance of results by taking into account the compactness and separability of the clusters. We choose a variety of indices on which to compare the collection of clustering algorithms. We use the PAC (Proportion of Ambiguous Clusters), the proportion of entries in a consensus matrix that are strictly between lower (defaults to 0) and upper (defaults to 1), to give a measure of cluster stability. In addition, if no reference class is provided, we calculate the average PAC across algorithms within each k, and choose the k with the greatest average PAC. If there is a reference class, k is the number of distinct classes in the reference. We see that the biclustering algorithm is the least ambiguous and also most well-clustered (high compactness and separability). Some algorithms perform too poorly to deserve membership in the cluster ensemble. We consider the relative ranks of each algorithm across all internal indices, and compute their sum. All algorithms below a certain quantile for the sum rank are trimmed (removed). By default this quantile is 75%. After trimming, we can optionally choose to reweigh the algorithms based on the internal index magnitudes. Of course, we take into account the direction of optimality (higher is better is lower is better). Algorithms reweighed are then fed into the consensus functions. This is done by replicating each algorithm by a scalar factor that is proportional to its weight. For example, if we have two algorithms A and B, and A is given a weight of 80% and B is given a weight of 20%, then we make 4 copies of A and 1 copy of B. To minimize computational time, the total number of copies out of all algorithms has an upper bound of 100. Without reweighing, each algorithm is given equal weight. #>   ..$ k              : chr [1:2] "3" "4"
#>   ..$ alg.keep   : chr [1:2] "HC_Euclidean" "KM_Euclidean"
#>   ..$ alg.remove : chr [1:2] "PAM_Euclidean" "DIANA_Euclidean"
The return value shows which algorithms were kept, removed (if any), and the trimmed (and potentially reweighed) cluster ensemble. To test whether there are four statistically distinct clusters (k = 4) versus no clusters (k = 1) using the PAM algorithm, we run sigclust with 50 simulations and generate a p-value for this significance test. #>   "Formal class 'sigclust' [package \"sigclust\"] with 10 slots"
#>   "..@ raw.data : num [1:100, 1:50] -0.0107 -0.7107 0.8815 -1.0851 -0.9322 ..."
#>   ".. ..- attr(*, \"dimnames\")=List of 2"
#>   ".. .. ..$ : chr [1:100] \"TCGA.04.1331_PRO.C5\" \"TCGA.04.1332_MES.C1\""
#>   ".. .. ..$ : chr [1:50] \"ABAT\" \"ABHD2\" \"ACTB\" \"ACTR2\" ..."
#>   "..@ veigval : num [1:50] 11.81 4.51 2.66 2.29 1.84 ..."
#>   "..@ vsimeigval: num [1:50] 11.81 4.51 2.66 2.29 1.84 ..."
#>   "..@ simbackvar: num 0.42"
#>  "..@ icovest : num 2"
#>  "..@ nsim : num 100"
#>  "..@ simcindex : num [1:100] 0.67 0.634 0.641 0.637 0.606 ..."
#>  "..@ pval : num 0.14"
#>  "..@ pvalnorm : num 0.163"
#>  "..@ xcindex : num 0.63"
The p-value is 0.14, indicating we do not have sufficient evidence to conclude there are four distinct clusters. Note that we did not use the full hgsc data set in this example, so the underlying biological mechanisms may not be fully captured. Estivill-Castro, Vladimir (20 June 2002). “Why so many clustering algorithms — A Position Paper”. ACM SIGKDD Explorations Newsletter. 4 (1): 65–75. Brendan J. Frey; Delbert Dueck (2007). “Clustering by passing messages between data points”. Science. 315 (5814): 972–976. C. Fraley, A. E. Raftery, T. B. Murphy and L. Scrucca (2012). mclust Version 4 for R: Normal Mixture Modeling for Model-Based Clustering, Classification, and Density Estimation. Technical Report No. 597, Department of Statistics, University of Washington. Campello, R. J. G. B.; Moulavi, D.; Sander, J. (2013). Density-Based Clustering Based on Hierarchical Density Estimates. Proceedings of the 17th Pacific-Asia Conference on Knowledge Discovery in Databases, PAKDD 2013, Lecture Notes in Computer Science 7819, p. 160. Campello, Ricardo JGB, et al. “Hierarchical density estimates for data clustering, visualization, and outlier detection.” ACM Transactions on Knowledge Discovery from Data (TKDD) 10.1 (2015): 5. G. Govaert and M. Nadif. Latent block model for contingency table. Communications in Statistics - Theory and Methods, 39(3):416–425, 2010. Isa, Dino, V. P. Kallimani, and Lam Hong Lee. “Using the self organizing map for clustering of text documents.” Expert Systems with Applications 36.5 (2009): 9584-9591. Brunet J, Tamayo P, Golub TR and Mesirov JP (2004). “Metagenes and molecular pattern discovery using matrix factorization.” Proceedings of the National Academy of Sciences of the United States of America, 101(12), pp. 4164-9. Developed by Derek Chiu, Aline Talhouk.